On ths date (N.S.) 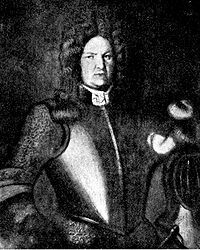 in 1707, Livonian nobleman Johann Patkul was broken on the wheel at Kazimierz Biskupi, Poland for a decade’s treasonable scheming against the Swedish crown. Livonia — essentially present-day Latvia, plus a chunk of Estonia — was at this time a part of the Swedish Empire in the latter’s twilight as a world power. Financially pinched after the protracted and bloody but indecisive Scanian War, the Swedish king Charles XI imposed his great reduction — a heavy tax on the landed aristocracy allowing the crown to reclaim as its own any property that it had held formerly and granted out. There was a lot of such land mortgaged out generations before to raise capital for the Thirty Years War. War giveth, war taketh away. Hands up everyone who feels bad for the nobility. Of course, all the 17th century nobles felt bad for the nobility. Johann Patkul was the young — maybe too young — man deputized by Livonian bluebloods to go complain about it to Charles. When sharp but respectful eloquence predictably failed to obtain his ends, he dropped the “respectful” part — and for this lese majeste had to bug out of Sweden with an in absentia death sentence at his heels. Having failed to obtain pardon from the offended monarch or from his heir Charles XII, Patkul just decided to change teams full stop. You could call this treachery (Charles XII did) but this is an age before nationalism. What was the Swedish royal house to a Latvian noble if he could get a better deal elsewhere? “Elsewhere” for Johann Patkul meant Polish-Lithuanian king Augustus the Strong, and/or Russian tsar Peter the Great. Our refugee aristocrat spent the 1700s conducting vigorous behind-the-scenes shuttle diplomacy to engineer an alliance against his former masters and carve their respective pounds of flesh out of Sweden. Patkul himself, of course, would get a healthy bite from Livonia for his trouble. In this campaign Patkul was merely an “unhappy instrument” (as a British correspondent quoted here put it): the antagonists in question had ample reason of their own for this statecraft; had they not, some itinerant conspirator pining for a lost manor could scarcely have conjured it. But Patkul was a useful instrument: energetic, discreet, willful, and so he could surely claim some ownership of the product. Think of him as the convenient enabler — the Ahmed Chalabi of the Great Northern War that tore apart the Baltic environs for the first two decades of the 18th century. It was rather fitting, then, that Patkul was devoured by his offspring when Sweden forced a peace upon Poland that resulted in Patkul’s being handed over to the Swedish authorities. The man’s extradition was specified by name in the treaty. Patkul’s brutal execution inflamed some outside opinion against the Swedes (which presumably mattered not a whit to the progress of hostilities); a purported account of his execution-eve conversation with his confessor is given in this extremely sympathetic English pamphlet. Though it’s safe to say that Patkul didn’t get what he wanted — let’s guess that the public shattering of his bones prior to a protracted death by exposure was towards the “worst case scenario” end of the calculus — the Great Northern War did indeed loose Livonia from the Swedish yoke … in favor, instead, of the Russian. Peter the Great accepted Livonia’s capitulation in 1710. Patkul is not to be confused with Baron Peikel/Pykul, a different fellow who was also executed for disobedience to Sweden in 1707.